You might be thinking that this is “just” common. But the feeling is not common. It has so many names which include nasopharyngitis, rhinopharyngitis, acute coryza, head cold, or simply a cold. The effect is normally on the nose. And this can easily be noticed to someone who is infected by a virus that causes common cold. The most common symptoms are sore throat, coughing, sneezing, runny nose and sometimes fever. If you have this sickness, you better have an understanding on how to cure it and avoid in the future. The most usual way for the common cold to be acquired is being in contact with someone who is already affected. Since the virus is airborne, it can be transmitted by means of exhausting it from the body to the target. It means to say that if someone in the house is affected by common cold, there is a tendency that everyone will be affected also. The transfer of virus is so quick. If you are looking for cures for common colds, you will definitely fail to find one. The thing is it has no cure. The best thing to do is cure the symptoms and you will eventually get the result. If someone has a fever, cure it. If someone has a runny nose, cure it. Medicines can be over-the-counter and you have to get rid of the idea that it can be cured by antibiotics. The fact is it cannot be. Staying at home is a good idea in treating common colds. This is due to the fact that it is a self-limited condition. We also have misconceptions that a cold weather causes common cold. This is not true. 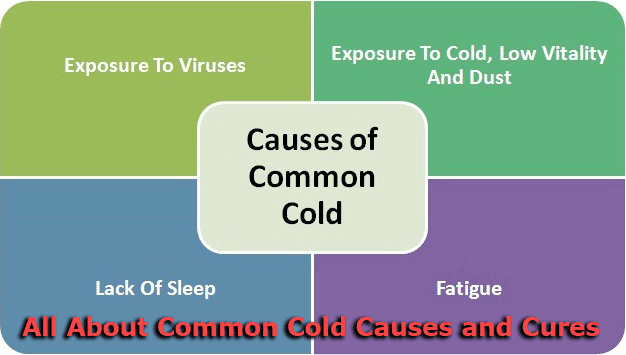 Viruses can easily multiply in cold weather and that is the reason for common cold. It is caused by multitudes of viruses.